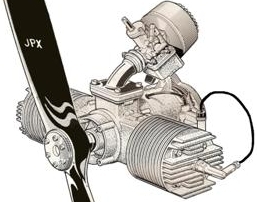 Lazair.com • View topic - Rotax 185 CDI Conversion...easy! The big difference in CDI modules is how they trigger. Most flywheel magneto systems use a small "pulser" coil outside the flywheel to trigger the spark. This is how the P200 works. These need a power wire, kill wire, trigger wire and an earth, called 3 connection plus earth. The system the R185 uses is internally triggered, that is triggered by the coil inside the flywheel. Power, kill and earth, called 2 connection plus earth. The red CDI module is not ducati, in fact it is not quite the same either. It is missing a connection the kill switch! Not a problem though, just short the power through a suitable resistor. Are you snowed in or something? This is a looong thread! I usually use Yenntai coils, but I'm looking at buying a locally imported chineese product so I can just go and get them off the shelf. I haven't been doing so many conversions latley. I find evenings/winter is when i get a lot of the background work done for lazair modifications - lots of reading and research. I have to or I would go crazy - I haven't been able to fly my lazairs very much but I am finally at the cusp of flying the 2-seater regularly. I just got off the phone with my local wildfire guy, and he is selling me JUST THE MODULE BOX for $125 Canadian. So I ordered one. anybody want to lend me their CDI inner coil? hard to ask, but if I break it I'll buy you a new one Trying to do this mod on the cheap - I'm willing to take this to the next step and try and get this going on my spare 185's for cheap. Off the shelf? There is one place thats worth a try, AET tolmin in slovenia, Peter used to look after me there but they are manufacturers, not retailers. If you really want to do the best CDI conversion, then find a place to mount an external trigger. There are lots of different ways of doing this and it would mean spending less than $50 per engine for a complete conversion. Get a stator for a pitbike and find a place to mount the trigger coil, that will get you a lot of options. However before anyone removes their CDI ignitor coil if you would get a few measurements with your multimeter. All voltage measurements are from the green wire into the CDI module to earth and will be AC voltage. The last two are ohms from green wire to earth and the diameter or guage of the enameled wire coil. oh for sure, I'll characterize everything (i was a former electrical engineer). maybe I'll call the local wildfire guy and talk him out of an igniter coil as well - i want to avoid having to pay for a stator plate and flywheel that I don't need. What I'm envisioning is determining where to drill the holes on the stator plate, and then making a tool to bolt to a stator plate, same diameter as the stator plate, made of 1/2" steel, with the same mounting holes. then there will be the three new holes for the locations to drill your original stator plate. Drill through the tool and you're done. Then people can just order this module (once i find a place to get it), and I'll have the requirements to rewind your igniter coil and I can mail you this tool to make your new holes. The other place to mount a trigger coil would be inside the the rotor. Without the points and condenser would there be enough room for a pulser? picked up my stator plate and CDI low tension coil today, and saw that wildfire has a new cylinder head out for the 185 - with a hole in the head for the decompression valve and a new valve design altogether. I gave up on the old decompression valves because they kept failing on me. I sure do miss the ease of starting though. A new valve design sounds great. I wonder if it might fit into the existing hole on the older engines?